This aerosol spray protects pencil work from smudging - you can continue to draw after the spray is applied. 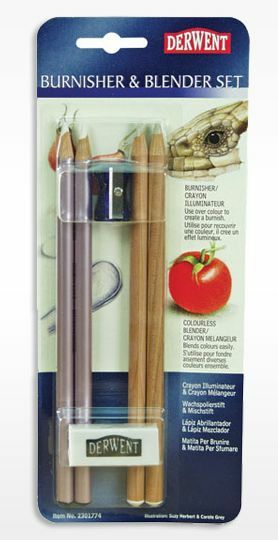 It can be used on color pencil, Graphite Pencil, Chalks and Pastels. These sealers are perfect for permanently protecting water-based media, such as Acrylics, Watercolors, Inks and Gouache. They are available in Matt, Satin and Gloss. I use the matt spray on acrylics, it makes the flat colors "pop". This is a great lamp. The light source is a 18W daylight™ tube (100W equiv). The unit can be mounted on a table edge or clamped directly onto an easel (clamps included). The neck is flexible and the light head pivots. Not cheap, but a great asset. You see precise colors every time you paint. No more eye strain.